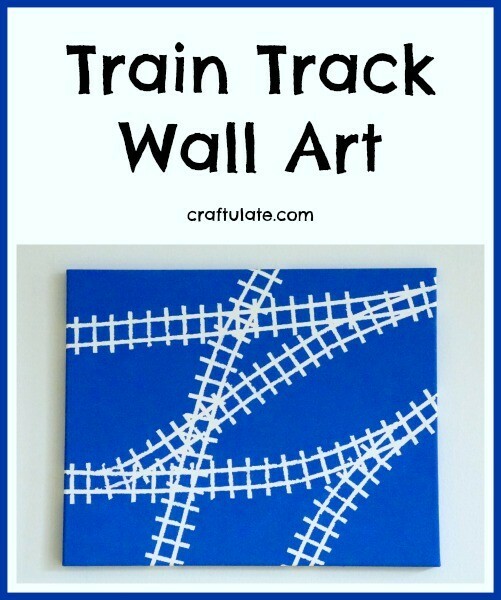 This train track art was created using one of our favorite painting techniques – tape resist! As you may know we have just moved house, and as much as we loved my son’s Construction Site themed bedroom, it is time for a change. If you’re a regular reader it won’t be much of a surprise that this time the theme will be trains! 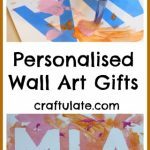 There are a lot of amazing branded room decor available – especially for Thomas & Friends, and we’ll probably get some of those items. But I think I prefer the majority of the decor to be non-character-specific. This was the first time that I’d worked with this super thin tape – and I love it! Perfect for going round slight corners. To start on the artwork, I needed to mark out a complex train track. I *nearly* made the mistake of sketching it out in pencil. The problem with that? I’d cover the lines with the tape, paint over it all, remove the tape – and SEE THE PENCIL MARKS in the white spaces that weren’t painted on. So I decided just to wing it and go slowly, planning my layout as I went. I started with sets of two parallel lines, marking out the track. Adding the railroad ties was actually slightly harder as it needed a *lot* of short pieces of tape all the same length. I made sure all the tape was firmly stuck to the canvas to ensure the paint didn’t get underneath. I wanted those white track lines to be as sharp as possible! I also extended the tape around the edges of the canvas as I wasn’t planning to frame it. Finally it was time to start painting, and of course I got my son involved. We had a lot of “Thomas blue” paint left over from making his Thomas Costume, and I thought we may as well use that! We used a foam brush and foam roller to try and get an even coating of paint. I turned the canvas around so that he could reach every part of it. Once the paint had dried, I carefully removed the three thousand pieces of tape. There were a couple of places where the paint had run under the tape, but overall it was very effective. And ready to hang in his new room! OMG I love that! What an awesome piece of art for his room and how proud he will always be to say he made it! !